Beginning in April 1968, Ford began factory installing a version of the 428 engine known as the “Cobra Jet”. The G.T. 500 was subsequently known as The Cobra G.T. 500 KR. The initials KR stood for “King of the road.” Ford rated the Cobra jet at 335 horsepower (250 kW), but with 440 foot-pounds of torque at 3400 RPM, the horsepower was considered significantly underreported. Shelby’s KR engine was left stock adding die-cast aluminum valve covers with “Cobra Lemans” to note Ford’s FE engine family victory over Ferrari at Le Mans in 1966 and 1967. The 1968 Shelby GT500KR is one of the best-driving, best-performing Shelbys of all time. After all; the car will not be dubbed as the King of the Road for no reason . With so much great features, this powerful car is a legend ro be considered in the automotive world and one of Mustang’s shining stars. 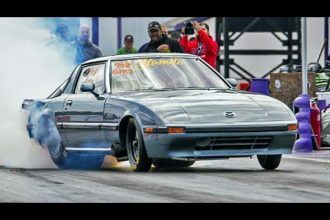 Giant Turbo Rotaries Dominate The Dragstrip @ TX2K16!